Want to win a $1,000 Sephora Gift Card? Watch “We Are The Joneses” every Saturday at 10/9c on Centric and look out for the question of the week. Tweet the answer using the hashtag #WATJSweepstakes and be automatically entered into the We Are The Joneses Watch & Win Sweepstakes. Participate once during each episode through May 28th for more chances to win. Tune in to Centric every Saturday between 10:00 p.m. ET and 11:00 p.m. ET weekly throughout the Sweepstakes Period to watch “We Are The Joneses”. Get the entry question that will be aired each week. Tweet your answer using the hashtag #WATJSweepstakes. 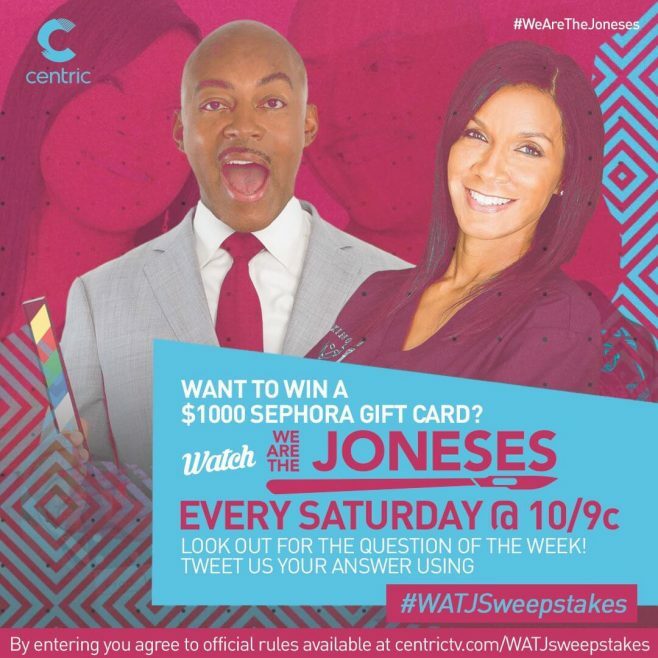 Entry must include the #WATJSweepstakes hashtag in order to be eligible. Visit www.Centrictv.com/watjsweepstakes to view the Official Rules. We Are The Joneses Watch & Win Sweepstakes is open only to legal residents of the 50 United States and the District of Columbia who are at least 18 years old as of the date of entry. The Sweepstakes Period begins on Saturday, April 22, 2017 at 10:00 p.m. ET and ends on Sunday, May 28, 2017 at 11:59 p.m. ET. Entries are limited to a maximum of one per episode. Sponsor will randomly select one potential winner on or about May 31, 2017 from among all eligible correct Submissions received during the Sweepstakes Period. Winner will receive a Sephora Gift Card valued at $1,000.00. Sponsored by Black Entertainment Television LLC, One BET Plaza, 1235 “W” Street, NE, Washington, D.C. 20018.